Last winter’s wave of student and youth protests held many points of interest, but one of the most amusing was the Daily Mail’s pearl-clutching front page on what it chose to call Rage of the Girl Rioters, in which it claimed that ‘rioting girls became the disturbing new face of violent protest’. While the article betrayed anxieties about social protest in general, the inclusion of visible female agency occasioned a particularly salacious shock. What this highlighted, besides what we already know about the Mail’s peculiarities, was its historical ignorance of female involvement in popular protest. Contrary to the fears of Middle England, this is nothing new – we have, like John Sullivan’s greatest comic creation, been revolting for years. Centuries, in fact, from the demonstrations by upper-class Roman women in protest at state restrictions on their use of luxury goods, through the involvement of women of all classes in the French Revolution, the Russian Revolution, and the great civil rights struggles of the twentieth century, to female participation in the current uprisings in Tunisia, Egypt, Yemen, and Libya. We have marched, struck, rioted, occupied, petitioned, organised and agitated not only on behalf of our own interests as women, but also as part of broader social movements and collective actions, both peaceful and violent, carried out for social, political and economic reasons. Often women’s involvement in protest has drawn on their gendered role within families and communities. 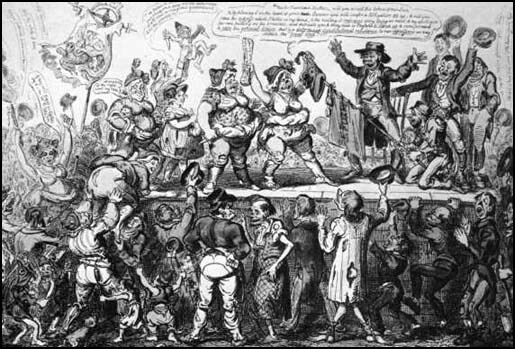 Women played a significant part, for instance, in the riots over food supply, quality and price which swept Europe during its transition to a capitalist market economy from the 16th century to the 19th. 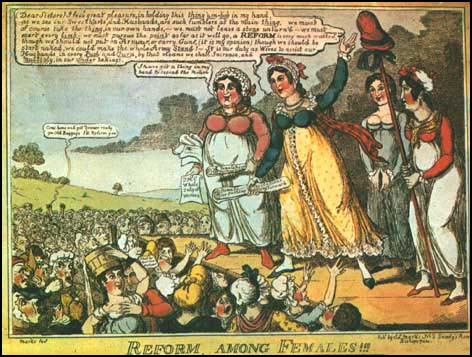 Historians like Temma Kaplan, E P Thompson and Natalie Zemon Davis have seen female participation in these protests as an extension of their role in the sexual division of labour, including food procurement and preparation, which lent legitimacy and authority to their involvement. The prominence of women in local networks of communication, and their presence in social centres like market squares as part of their daily routine, also allowed them to collectively mobilise and organise – the equivalent, under agrarian capitalism, of creating a Facebook Events page. There is, however, a myriad of other movements and moments in which women have taken part as workers, students, trade union organisers, family members, and consumers, as well as on grounds of class, race, sexuality, and political principle. There’s even a Wikipedia list of female rebel leaders dating from the 9th century BC to this year’s uprising in Ivory Coast. Just as their presence is still being obscured in reports of current uprisings in the Middle East, so women have historically been absent from many popular and academic accounts of protest. The advent of feminist-influenced social history from the mid-20th century sought to correct the masculine bias of traditional narratives of labour history or liberal teleologies which marginalised or misrepresented the involvement of women. Strictly purist or doctrinaire feminist narratives of history have also tended to ignore popular movements which did not advance a specifically feminist programme, regardless of how heavily women may have been involved. Both of these approaches resulted in the omission of women from the histories of protest movements such as Chartism in which they played a significant part. It is at the point where the revolution starts to move women out of their passivity into the conscious and active role of militants that the mockery, the caricatures, the laughter with strong sexual undertones begin. Women in protest don’t merely have attacks from the right to worry about. Their involvement does not take place in a vacuum – women protest not only as women but for myriad reasons of sectional interest, and the gender identification of protestors has historically generated conflict and tension with identities based along lines of race, class, sexuality and ideology. To take just one example, the involvement of women in 20th century industrial conflict, acting in support of or solidarity with male industrial workers, has been criticised by some feminists who view such conflict as manifestations of a macho patriarchal culture from which women should separate themselves. Nor can it be assumed that female involvement in social protest will naturally result in an outcome which is cognisant of, sympathetic to, or even comfortable for women. After the Women’s March to Versailles, women as revolutionaries became a potent symbol of the power of the French Revolution, and the young Republic was eventually personified in the figure of Marianne. As Joan Landes has argued, Marianne’s visual prominence did not mean that women obtained any significant political, social, or economic advantages during the French Revolution; the new Republic’s politics was one of laws and texts in which Marianne’s image bore no concrete significance. Similar tensions are apparent in the complex relationship of Iranian women with the after-effects of the 1979 revolution, and the contention that the presence of women in the ‘Arab spring’ uprisings, when acknowledged at all, is being appropriated and used symbolically.